USPA NEWS - The African Diaspora Network welcomes you to our fourth annual African Diaspora Investment Symposium (ADIS2019). Entrepreneurs, innovators, investors, and public and private sector leaders are invited to join us for this catalytic convening that seeks to uplift the African continent by building bridges among Africans, African Immigrants in the Diaspora, and friends of Africa. Ime Archibong is the VP of Product Partnerships at Facebook. His organization builds and manages global partnerships in support of Facebook's mission by driving product and business strategy. For the past eight years, his team has led on a number of key corporate initiatives, including the developer platform, community leaders program, local business product integrations, music and video partnerships, messenger bot platform, Internet.org connectivity efforts, and digital skills & education initiatives. Prior to Facebook, Ime was an Advanced Technology Business Development Professional at IBM. He started his career as a software engineer in the IBM Systems and Technology Group. 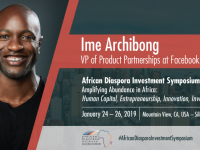 African Diaspora Investment Symposium's 2019 theme “Amplifying Abundance in Africa: Human Capital, Entrepreneurship, Innovation, Investment” explores intersecting ecosystems of infrastructure and economy in Africa. Follow the footsteps of entrepreneurs who have walked the path of pursuing investments and opportunities in Africa and learn from the stories and strategies of our growing community. 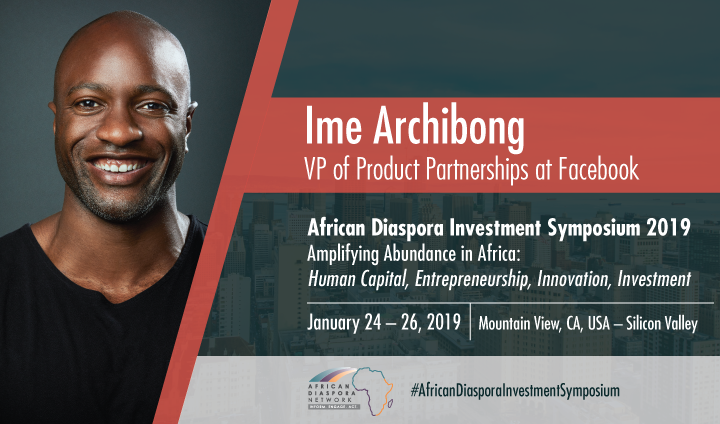 The African Diaspora Investment Symposium is an annual conference in Silicon Valey that celebrates entrepreneurship in California and gives opportunities to network to Entrepreneurs who want to start or grow their business in Africa. The Africa Global Chamber of Commerce based in Chicago and Act For Africa International based in Virginia in the United States of America aong with the Global African Diaspora Network Inc located in New York City are supporting the fourth edition of the Afrian Diaspora Investment Symposium and inviting you to come and engage the conversation on how we can invest in the Mother Land. African Diaspora Network is a registered 501(c)(3) non-profit membership organization. Our mission is to harness and engage the intellectual, financial, philanthropic and entrepreneurial capacity of Africans and friends of Africa in support of economic and social development across Africa. Since 2010, the African Diaspora Network (ADN) has energized collaboration among Silicon Valley entrepreneurs, philanthropists, and African diasporans to uplift its local community towards the benefit of Africa. ADN is dedicated to providing virtual and physical forums to accelerate access to resources that foster partnership, knowledge sharing, and advance investment opportunities.